The ability to go fast is not the only criteria for exhilarating performance. The ability to pair fascinating horsepower with the highest standards in comfort is a central demand for yachts and pleasure craft. 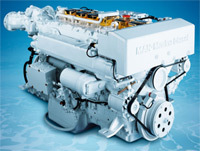 MAN diesel engines will power your boat into the planing phase quickly. At this phase, you will run with a distinct smoothness that offers a relaxed, comfortable but nevertheless thrilling excursion afloat.